Tamaryokucha is a fine Japanese green tea. 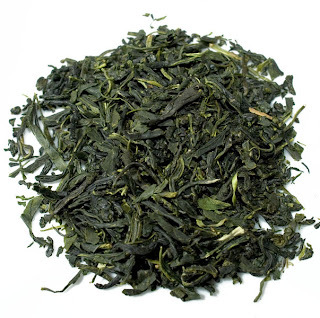 The word tamaryokoucha means "curly green tea" because of the curled shape of the leaves. Such shape of tea leaves is result of the extra processing steps. Tamaryokucha is made primarily on Japanese Kyushu island. Local Kumamoto prefecture produces most of Tamaryokucha in Japan. There are two types of Tamaryokucha. Pan-fried and steamed. Pan-fried, or Kamairi style was the original technique used for Tamaryokucha learned from Chinese green tea production. Current market tendency is to producemore steamed Tamaryokucha. Tamaryokucha has a deep, earthy flavor...It can be steeped more than once, each time creating little bit different flavor and aroma. This type of tea also requires a slightly cooler water temperature to bring out the full flavor and avoid "cooking" the tea leaves. Did you purchased this tea from demmers?